Filed to: AVAST!Filed to: AVAST! The San Diego Maritime Museum is a neat thing. 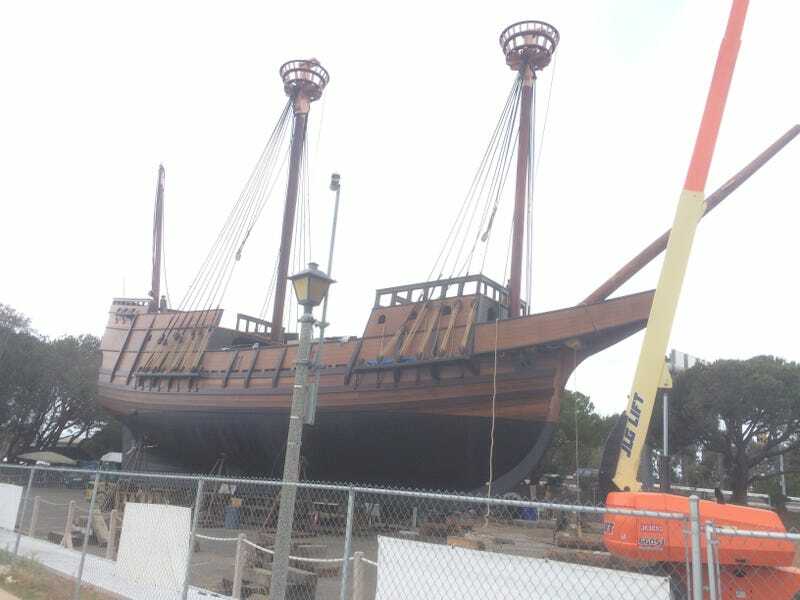 They are all about acquiring and displaying ships that are historically significant to the State of California or, in the case of the San Salvador here, just building their own copy using both period-correct construction techniques and tools along with modern niceties like working heads and modern propulsion. The San Salvador is an exact copy (apart of the modern stuff) of Portuguese explorer Juan de Cabrillo’s ship of the same name. He’s the first European to discover what would become San Diego back in 1542. The museum has several other ships including the flagship, Star of India, the America (replica of the boat the Cup is named after), the Californian (replica of a 19th century revenue cutter) and several others. Their next project is going to be building a period-correct 15th century Chinese Junk.” Why a Junk?” You ask? Well, because. I’ve been watching construction on this one for that last 5 years or so. They take their sweet time one these, primarily because the craftsmen doing all the work are volunteers. It’s been rather fascinating to watch. They built this at Spanish Landing next to Harbor Island and the airport. They had an entire mill set up under the Harbor Drive bridge as they had to custom mill each spar, etc as they went. It was quite an operation. The plank seams along the siding were sealed using the painstaking old method of pounding in oil cloth batting with a wood mallet and wedge and all joints are fitted with wood dowels and massive dovetail joints. Twin diesels and their accompanying screws will motivate the ship when wind doesn’t cooperate. The plan is for the ship to make regular runs up and down the California coast a couple times per year once she’s done. This thing will get real service! They are just finishing the last of her rigging now and she’ll be launched (I think) sometime in July. She’s being fitted-out with 100% period correct rigging. Here’s a shot of her anchors. She also is rigged with working cannon and deck guns.